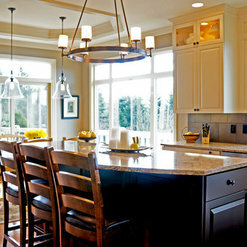 Kitchen Plus has been updating and improving kitchens and bathrooms all over the Greater Seattle Area since 1992. 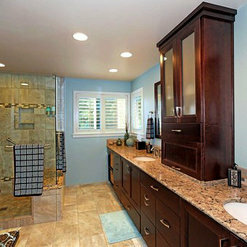 We specialize in custom built cabinetry and full kitchen and bath remodels. 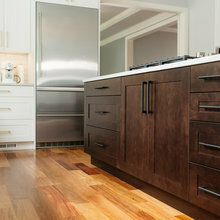 Our cabinets are custom made in our state of the art cabinet shop located in Kirkland. We have a beautiful 6,000 sq. ft. showroom in Bellevue where we have multiple kitchen and bath displays as well as a variety of the latest materials available to help inspire you with your remodeling project. You can also view quartz and granite slabs in our adjoining Slab Gallery Showroom. 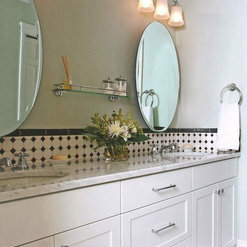 We have a team of experts on staff to assist our clients in order to create a worry free remodeling experience. 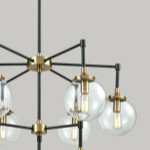 Our 5 step process begins with an in home consultation with one of our talented designers. 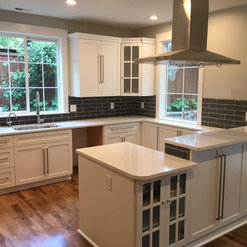 We are thrilled with our kitchen remodel! Kitchen Plus did an amazing job end to end. Jessica our designer was great about helping me with ideas on how to modernize my kitchen within a reasonable budget, Tom was speedy at getting our drawings and permits in order, and Tim our on-site project manager was super friendly and respectful of our space, very knowledgeable and did superb finish work. They were done in one month and it could not have gone smoother. I highly recommend! Kitchen Plus did an excellent job on our kitchen! They took care of everything, from providing multiple designs for us to choose from, to helping select colors and materials, to solving problems discovered after the project started (like unexpected drain locations and air vents, to extraneous fire sprinklers and uneven subflooring), to taking care of unexpected code requirements -- and through it all they stayed exactly on schedule. Overall very happy with the work they completed for us. Would hire again for another project if we ever do something this major again, and would absolutely recommend to others. Recently had my kitchen remodel done by KP, I worked with Jessica Bell (the designer) and Mike Nause (the PM/installer) - both were amazing. I highly recommend these folks. Jessica worked diligently and patiently with me - she took the time, asked all the right questions to really understand my needs in the kitchen, providing the best solutions from cabinet space, counter tops, to appliance locations. She was transparent and reasonable in her recommendations, taking the time to explain all nuances of the process end to end. 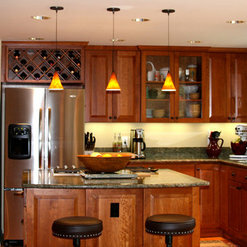 Mike who installed the cabinets was meticulous, clean and careful in his workmanship. Everyday he left the job site clean and organized. I can't tell you how much I appreciate this (as I'm a bit OCD). They both paid great attention to every little detail and I couldn't be happier with the experience and outcome! I will definitely go back to KP for future home improvement needs! Kurt - our sales person - did a great job to make sure we were comfortable with what we were doing and he help to alleviate any concerns we had as we progressed through the project. Uri, our project manager, and his team did a great job in keeping us in the loop as we moved through the demolition to completing the project. They always cleaned up after a days work and they were always willing to listen. Very engaging team! Finally, Kitchen Plus met the dates they provided, from our initial meetings, follow up designs, demolition and installation. We look forward to working with them again in the near futre. 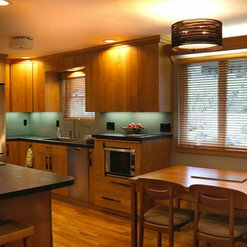 This was our second kitchen remodel with Kitchen Plus with our first in 2008 at previous home. Their tag line On Time-On Budget is exactly what happens. During demolishing the support beam was not as anticipated (sorry don't know building terms etc) and previous kitchen remodel in 80's by former owners had faulty electrical work. However, with KP any problems discovered after signing the contract are covered by the company not the owner. In addition, they guarantee time to complete model and if they go over promised end date they pay you! There is a lot of planning that goes on prior to start date including picking all necessary cabinets, hardware etc and when day one starts the project manager can tell you exactly what date what work will be done. Our project manager Tim Burr was fantastic! He was prompt, detailed oriented, conscientious, hard working and good to our dogs who wanted to sneak in and see what was going on. Can't thank him enough for making our kitchen remodel as painless as possible. KP stands by their work. As we settle back into kitchen and notice any little detail that is off, Tim will be available to fix or remedy problem. Ongoing we can contact KP service department as they guarantee their work. Hopefully we won't move again and need another kitchen remodel, but if we do Kitchen Plus will get a call! We are thrilled with our new kitchen & baths! 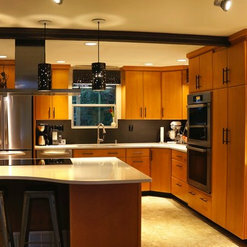 Kitchen Plus made the process as easy as possible and we were well taken care of from beginning to end. Shannon and Jennifer, the designers, helped us choose just the right cabinets, floors, counters, and finishes to bring this 40-year-old house more up-to-date and functional. Craig B took excellent care of the technical design details. Mike N, our project manager, shepherded the project professionally and with good humor, on time and on budget. Mike in particular was responsive to all the concerns that we had along the way and remained customer service oriented during the entire process, allaying our anxieties over the many decisions we had to make and the outcome. He demonstrated skill, humor, and most of all integrity, throughout the project. We actually kind of miss having Mike and his team in the house. 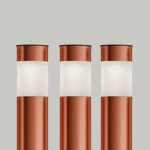 They are all skilled professionals, and it shows in the quality product they provided to us. Friends of ours have been astounded at how well this project went. They have used other companies and big-box stores and told us horror stories that make us doubly glad we went with Kitchen Plus. I’ve seen negative reviews of this company, and I wonder if they are even reviewing the right company because I just can’t see any of the Kitchen Plus team being anything but outstanding. There were a few small issues that had to be addressed once the project was complete. Kitchen Plus stood behind their warranty and those were rectified to our satisfaction. 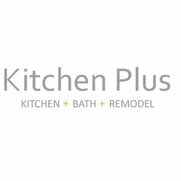 We definitely recommend Kitchen Plus for your kitchen and bath remodeling needs. We would not hesitate to contract with them in the future. Kitchen Plus did a fantastic job and were On Time and On Budget. 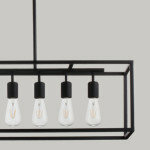 Sophie was our Designer, she was easy to work with, responsive to our needs, and gave her design expertise. 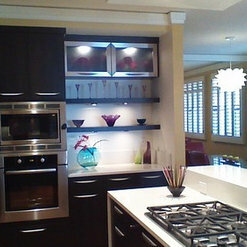 We wanted to do a mixture of lower cabinet reface and upper/island/corner cabinet new construction. Erik was our Project Manager. He really takes pride in his work, focuses on fine tuning the installation and even offered a great suggestion of adding corner shelves vs. a false cabinet front which ended up being a lovely finishing touch. Erik posted a schedule of what would be happening each day, as well as having a check list for him each morning of questions we might have from the previous day. The process was streamlined and amazingly went along as scheduled. I would gladly do another project with this great group of people. We called Kitchen Plus because we had a slight sagging in a cabinet we bought there several years ago. They arranged for Craig Bieggar to come to our home to see if he could correct this problem. Craig did a terrific job of assessing the problem, determining the best way to correct it - and then he worked his magic! He replaced the hinge and adjusted the door which has worked great ever since. While he was here, he also made some other minor adjustments on some drawers and cabinets that were 'not quite right'. Craig is clearly a thorough, conscientious and very responsible workers…. Am very appreciative to Kitchen Plus and their team for their excellent service - and for supporting such a high quality employee!!! Thank you. We are very happy with our new kitchen! 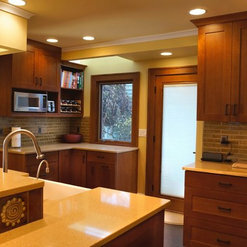 Kitchen Plus made the process as easy as possible and we were well taken care of from design to completion. 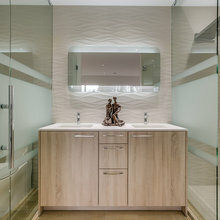 Gloria worked closely with us to come up with the best design possible for the space. Brent and James did a great job executing the design and completing the project on time. Brent in particular was responsive to any concerns that we had along the way and remained customer service oriented during a chaotic process for a home owner. Kudos to the whole Kitchen Plus team. I have remodeled three bathrooms with Kitchen Plus within the last 5 years. I find their customer service to be excellent. They respond to my needs/requests in a very timely manner. In my lastest remodel- the project manager Chris- was polite, professional, tidy, a good communicator and very knowledgeable. I felt very comfortable having Kitchen Plus in my home for 6 weeks. They do quality work. I love my bathrooms!! KP did a great job for us. Sophie was a our salesperson and great to work with. Tom B was our PM and took care of us through the process. 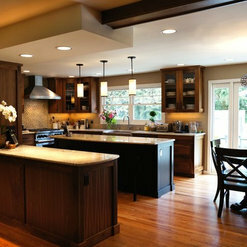 We used Kitchen Plus for a kitchen/powder room/laundry room remodel. Our designer was Georgia and our project manager was Tom Busch. From beginning to end it was a fantastic experience. Everyone was incredibly professional and helpful. Georgia helped us with the design and picking everything for the project. It was great to have an expert guide us through the many choices of materials and she made it painless. They kept in touch with us in the lead up to the project and were extremely thorough. We knew what we needed to do on our end (which wasn't much) prior to the project start date. They coordinated all the sub contractors which made it so much easier on us - only had to contact Kitchen Plus and they took care of it all. Once the project started Tom was a fantastic project manager! He always let us know what was coming up in the next couple of days and his work was impeccable! If there was any little hiccup he had it taken care of before we even had to worry about it. I never had any worries because Tom took care of us like it was his own home. I can't say enough about how great he was to work with! We are so pleased with the final outcome. Kitchen Plus is probably not the least expensive way to go vs. a general contractor. However, the whole experience was turn key and made the project seamless. They coordinated so much of the project for us from the hard wood flooring, appliance removal and reinstall, electrical - it was the best way to go! We had a bit of a wait from the time we picked everything out to when the project started, but once it did everything was finished quickly and right on time. 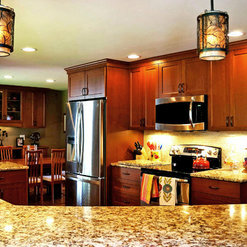 We will definitely be using Kitchen Plus the next time we have a home remodel project! Commented: where can i purchase these counter stoolsUnfortunately I do not know. 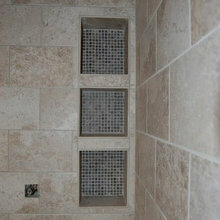 The client purchased these before we did the remodel. Commented: Gorgeous kitchen! Walnut? Also, what color is the hardware? Thanks!Thank you! 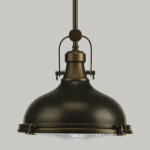 It is walnut, and the hardware is an oil rubbed bronze finish. 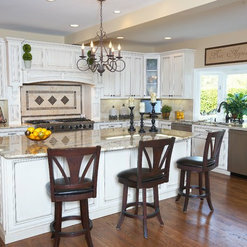 Commented: Countertop?Jeanne I'm glad to hear you like this kitchen. This countertop is a natural granite, the color is Vyara Gold. Commented: Flooring? ?This was the client's existing red oak floors that we refinished in a custom medium stain during the renovation. Commented: Do you colour code your wardrobe?I do color coordinate my closet. My shirts go from lightest to darkest and in each color section, I put the shortest sleeve to the longest. Commented: Hardware finish dilemmaNo. Since there is a wall seperating them from the rest of the main floor, you can pick something else for your daughter's room and attached bath.